You want copy editing and proofreading that will help you stand out, and I can help. You can expect beautifully edited content combined with expert advice to give your writing the right level of polish and professionalism. I’ll copy edit your work so it’s structured well, flows from point to point, gets your key ideas across, and reads perfectly. Naturally, I’ll also proofread your writing for grammar, spelling, word use, and punctuation to make sure it’s error free. Your writing needs to make a great first impression with readers, clients, or customers. You’re publishing your content and want to make sure there are no grammatical mistakes. You want to sharpen your writing, make sure it’s focused, and remove duplication and ambiguity. You want your audience to take a specific action after reading your content. You need advice and editorial guidance to strengthen the text. I edit and proofread all types, lengths, formats, and styles of non-fiction content including manuscripts, books, reports, websites, online content, documents, articles, essays, dissertations, guides, presentations, and manuals. If it’s not on this list, ask me. Every writer wants their work to succeed, but sometimes you need another professional to help you transform your words into something powerful. I copy edit and proofread from the viewpoint of your audience, and tweak your work so that it gets to your points quickly and easily. I specialize in non-fiction editing because good, fact-based, engaging ideas deserve to be read and will help you get the results you want. I make sure the whole proofreading and editing experience is fast, simple, and effortless for you. I read through your work so I understand it, then go through your writing line by line, making the specialized proofreading and editing changes that your content needs. I provide feedback, comments, and advice to strengthen the work. Finally, I complete a second read of the entire piece to make sure it’s error free. I track all of my edits so you can see exactly what I’ve changed. With over 20 years of experience as a professional proofreader and editor, I know how important it is to provide freelance editing services you can trust. I have a fast, friendly, and reliable approach — that means means clear, open communication, always meeting deadlines, high-quality, personalized editing, and providing advice and support throughout. I’ve answered some of the more common questions about my editing and proofreading services below. If your question isn’t covered, please get in touch and I’d be happy to help. What expertise do you have in non-fiction copy editing and proofreading? I copy edit and proofread all types of non-fiction content. I’ve given examples for some of the work I edit above and you can find testimonials on my services here. I’m also happy to provide further information on non-fiction proofreading and copy editing, contact me here. How long does it take you to copy edit, proofread, and return non-fiction work? It depends on the length of the work and how busy I am with other proofreading or editing. I normally aim to return work within five working days, although if you need it back more quickly please let me know and we’ll agree on a deadline. Do you edit fiction work like novels or short stories? I only edit non-fiction work. The skills and approach of a fiction and a non-fiction copy editor are very different, so I specialize in non-fiction because that’s where my experience and expertise is. I edit multiple types of work including business content, academic writing, books, reports, documents, and manuscripts. Do you write or create original non-fiction content? I polish, edit, and proofread non-fiction work that’s already been written. If you need a writer to create original content, please contact me and I’d be happy to provide some suggestions. I offer practical, focused advice and suggestions to help you strengthen your work. I read through your content as your ideal reader would, and edit your writing to get your points across. If there’s a specific area that I think could be strengthened by you rewriting, clarifying, or otherwise changing your work, I will provide suggestions for improvement. 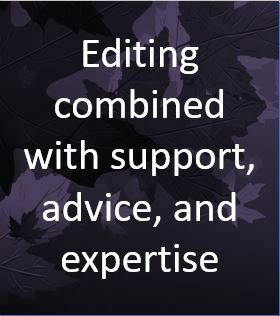 Learn more about how I provide editing advice. How do I know if I need non-fiction copy editing or proofreading? Are your non-fiction editing and proofreading quotes fully inclusive? Yes, I edit with sensitivity to make sure it's your thoughts, ideas, and research that come through. I also ensure your writing is clear, concise, and easy to understand. I edit for flow and comprehension, so you get your point across in the most effective way. It still sounds like you wrote it, only more precise. Can you edit to a style guide?